To investigate your mortgage options call our telephone based mortgage advisor team on 0117 313 7780 or fill in our call back form. What does the Halifax Offer? Flexible mortgages – whichever mortgage you choose, you can benefits from a range of special features designed to help you manage it more easily. 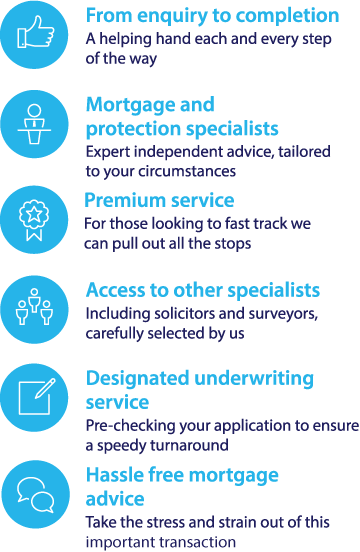 Expert mortgage advisers – as well as helping you to arrange your mortgage,Halifax mortgage advisers can help you arrange a survey or help you find a solicitor to do the conveyancing. Easy application - once you’ve had an offer accepted, you can start your mortgage application online, over the phone, or in person at your nearest branch. As part of our mortgage service we have access to Halifax mortgage deals and so if you are looking to renew your mortgage or get a new deal we can help. As part of our process we will search the market for you based on your criteria we can compare Halifax rates with the rest of the market. Once we have an agreement in principle from a lender if it is better for you to switch to a new lender based on interest rates, fees or other criteria such as maximum age then we can arrange this for you. Otherwise if it is better to stay put we will contact Halifax on your behalf and arrange the paperwork much of which can be done online. We will take into account any existing early redemption penalties if applicable before recommending any course of action. As part of the mortgage process we will ask if you have life insurance in place to provide protection. Remortgages - Deals if you need to remortgage your home. We can advise if it is better to stay put or move to a new lender. First time buyer mortgages if you are looking to get on the housing ladder including help to buy mortgage products. Halifax can help if you are looking to buy a new build property. Self Build - If you are looking to arrange finance for a self build development project then products are available where monies can be drawn down at each stage of the project. the current loan to value limit is 75% LTV. Halifax has been providing mortgages for 150 years, and was formed in 1853 as the Halifax Permanent Benefit Building and Investment Society. In 2001, Halifax merged with the Bank of Scotland, taking the name Halifax Bank of Scotland (HBOS). In 2009, HBOS was acquired by the Lloyds banking Group. Nowadays, Halifax now provides a wide range of mortgages to suit different borrowers. To compare Halifax mortgage deals with other leading mortgage rates and find the best deals for you, use our mortgage calculator above or call our mortgage team today. Compare Halifax Mortgage Rates - Halifax offer a selection of mortgage products for first time buyers, home-movers and for those looking to remortgage.